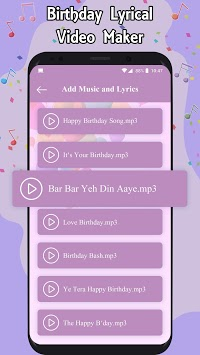 Birthday Lyrical Video Maker App is best app to make birthday lyrical video song with photo and video. You can make 30 sec video status in 1 minute. There is a new craze on social media to share birthday video with pictures and music. Photo Lyrical Video Status Maker is an app that provides videos Maker for sharing on social media. 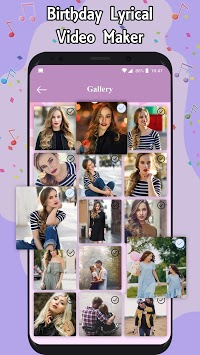 This is a birthday video status maker application you can easily create video using many beautiful Birthday Songs and attractive birthday themes effects. Birthday Lyrical Video Maker has something new concept you can make birthday lyrical video of your own beautiful photos. 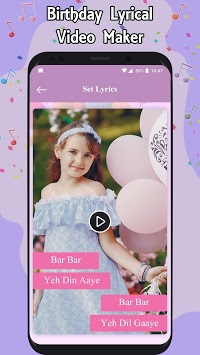 Birthday Lyrical Video Maker has large lyrical video song library, you can select your favorite video and create song. ❤ Select a song of your choice from collection of lyrical songs. ❤ Select your pictures from gallery or from your mobile. ❤ Rearrange photos: Rearrange order of your selected pictures for making video. ❤ Select Birthday Themes and add it to in your Video. ❤ Easily Save and Share your created video via social media. ❤ You can share and delete your created video which are saved in my work by your choice. ❤ My Work Contains all the created videos at one place for future use.